Have you ever thought to yourself “Geez, I wish there was a way that I could answer calls on my cell phone while I’m riding”? Well, I haven’t, and I personally believe that talking on your cell phone while riding a motorcycle is a terrible idea. But I do believe that every person has the right to make their own choices, and I’m sure that some of our readers are interested in a device that allows them to keep in contact with the rest of the world while riding. Like I said, I don’t think it’s safe or smart, but if you choose to use your cell phone while on your bike, you might be interested in a product like the Scala Rider. Everyone who hasn’t been living under a rock for the last year has noticed the amazing proliferation of Bluetooth headsets – those wireless earpieces with the stubby microphone, which link up with your cell phone through a wireless networking protocol called Bluetooth, allowing you to chat away while your phone handset is safely tucked away in your pocket. While I do know a few people that employ standard Bluetooth headset while riding, in general they are not ideal for under-helmet wear – being too bulky to comfortably fit between your ear and the helmet liner. Even if you can get one to fit, you’re still left with the questing of how to answer calls while riding – it’s hard to push a button on your phone or headset when you’re rolling down the freeway at 80mph, headset in your helmet and phone in your pocket, wearing bulky riding gloves. 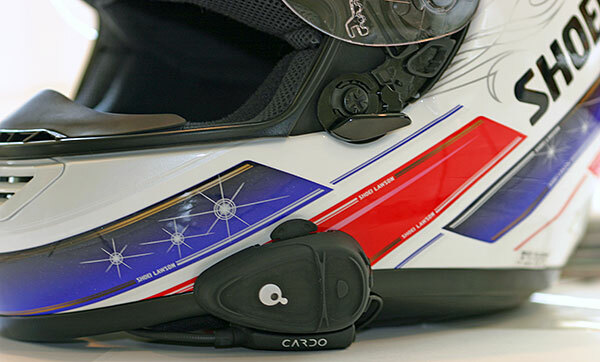 Cardo Systems has eliminated all these problems with the first Bluetooth wireless headset designed specifically for motorcyclists. The Scala Rider is easily attached to your helmet by slipping a clamp over the bottom edge of the helmet shell and tightening two hex screws to hold it in place. The microphone extends from the unit on a flexible boom, which allows you to easily position it between your lips and the chinpiece of your helmet. Finally, the speaker dangles from a thin cord, and can be attached inside your helmet (next to your ear) by sticking its velcro backing to your helmet’s cloth liner. The Scala Rider’s main unit (shown in the picture above) features a large button on the side, which is used to turn the headset on and off (by holding it for about 5 seconds) as well as to answer incoming calls while riding. The button is big enough to be easily operated by gloved hand, as are the two volume buttons (the top turns it up, the bottom turns it down) located on the rear face of the unit. The Scala Rider is just as simple to hook up as any other Bluetooth headset – power it on, navigate through your cell phone to the Bluetooth networking menu, and ‘pair’ the two devices. After the initial pairing, the phone will automatically link up with your Scala Rider anytime the headset is turned on. So how does it work? Surprisingly, the Scala Rider is easily audible to the rider, even when traveling at freeway speeds. A reasonably clear conversation can be conducted at speeds of up to 80mph, even on modern sportbikes – whose low fairings tend to throw the wind right at the rider’s helmet, leading to a high volume of wind noise. Bikes that offer better wind protection to the rider’s helmet area may allow conversation at even higher speeds. So if you REALLY need to talk on your cell phone while you’re riding, then the Scala Rider is the headset for you. I just hope you can keep your attention on the road while chatting; personally, now that I’ve reviewed it, I won’t be using the Scala Rider any further. It does what it’s designed for, and does it well – it’s just that I feel it is unsafe to have cell phone conversations while riding. The Scala Rider retails for $150, and you can find more info at the Cardo Systems site.